OFCS READY TO WELCOME BACK STUDENTS! Olmsted Falls City School District looks forward to welcoming Bulldog students back to the buildings this week for the start of the 2018-2019 school year. We hope everyone has enjoyed the long summer and is looking forward to the new school year. It promises to be an exciting one! To download a copy of the 2018-2019 school year calendar, please click HERE. ATTENTION BULLDOG PARENTS: Please be sure that you have completed the online Returning Student Registration before your child’s start date. Reminders have been sent to parents/guardians of students who still need to have their information updated. For assistance with Returning Student Registration, PowerSchool parent account log-in, and/or linking multiple students under one PowerSchool parent account, please contact your child’s school building or contact Mr. Tim Wulfhoop at twulfhoop@ofcs.net. Freshmen entering Olmsted Falls High School this year will participate in a new, full day orientation program designed to help students successfully transition into high school. OFHS looks forward to hosting the new program for all incoming 9th graders as well as students new to the district tomorrow – Thursday, September 6th. To read local media coverage about the new OFHS freshman orientation program featured in Cleveland.com, please click HERE. Finishing touches were being put on the new OFHS cafeteria and media center space this week in anticipation of the first day of school. Freshmen students attending tomorrow’s orientation day will be among the first to experience the amazing new hub of the building! Continuing thanks to our entire Bulldog community for making these much-needed renovations possible! Stay tuned for updates on completion of Phase 2, which includes the new construction expansion portion of the project. We look forward to celebrating with the entire community later this fall! The start of each new school year means buses are back on the roads throughout our school community. We ask everyone to be patient and mindful of safety laws specifically relating to school buses. For additional information, check out the latest Olmsted Dates & Data column for important community news coverage by clicking HERE. Need a printable First Day of School sign to make it even more official? Click HERE to download printable. Don’t have Twitter? E-mail your photos to us at info@ofcs.net to be included in the back-to-school photo gallery to be featured on an upcoming district blog post. The district’s partnership with the Olmsted Township Safety Forces and Southwest General Health Center has facilitated specialized “Stop the Bleed” kits for each school bus in the district’s fleet. Each OFCS school bus on the road now has a Stop the Bleed kit, which includes an elastic tourniquet, clotting sponge and hemorrhage control and stretch bandages. Stop the Bleed is a national campaign through Homeland Security that recognizes the importance of having the proper first aid supplies and training to quickly stop bleeding in the event of an emergency. 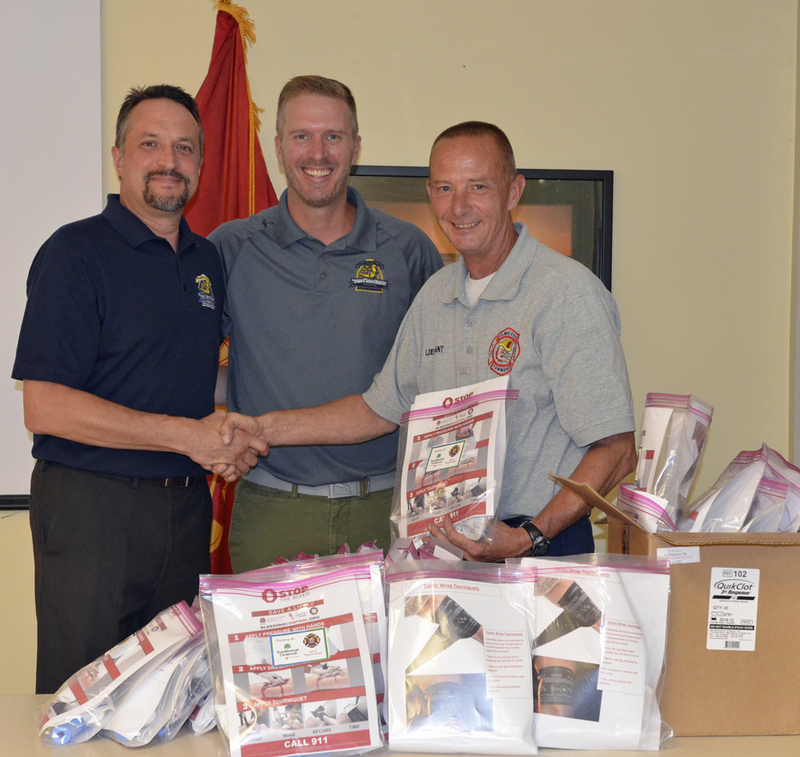 Several groups, including Southwest General, the Olmsted Township Fire & Police Departments, Olmsted CERT and the school district officials met Aug. 24 at the Olmsted Township fire station to assemble the kits. Bus drivers participated in training and certification in this effort during their professional development day held Wednesday, Sept. 5th. Olmsted Township Fire Chief Patrick Kelly also worked with OFCS Superintendent Dr. Jim Lloyd last year to provide one of these kits in each of the district’s buildings and trained a select number of staff as well. The district plans to provide opportunities for additional staff members to be trained in the future. The kits will supplement traditional first aid kits already on the buses. Bus drivers often are on their own transporting students and staff, whether to or from school, a field trip or extracurricular activity, and can be the first to provide medical care in an emergency. To see a Sun Post-Herald story about this event and the program, click HERE. A special THANK YOU to all who made this presentation and kits available to our schools. What an awesome first game of the season at our Charles A. Harding Memorial Football Field! The Bulldog football team and the Olmsted Falls High marching band both had wonderful performances and brought home wins for our school! For those who were unable to attend the game – or want a repeat of the band performances, here they are! 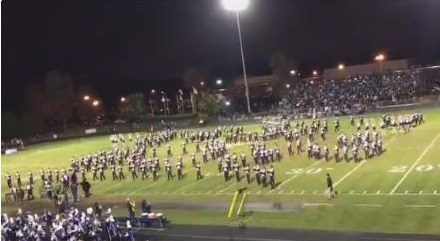 To view the OFHS Bulldog marching band pre-game show, click HERE. To watch the half-time performance, click HERE. The Olmsted Falls High School Cheerleaders are excited to extend an invitation to all Olmsted Falls students in Kindergarten through Fifth Grade to attend a Cheerleading Clinic and cheer under the Friday night lights during the Olmsted Falls v. Amherst – Steele Varsity Football Game! CHEER AT THE OLMSTED FALLS VARSITY FOOTBALL GAME Olmsted Falls v. Amherst – Steele on Friday, September 28, 2018 Cheerleaders should be dropped off in the OFHS Gym no later than 6:15 p.m.
Olmsted Falls Cub Scout packs 102 and 252 invites boys and girls in kindergarten to grade 5 to its annual Open House. It is from 6:30-8 p.m. Monday, September 10th in the Falls-Lenox Primary School’s east gym. Parents are asked to attend with their child. 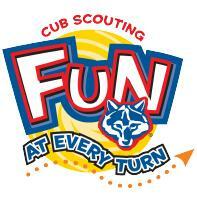 We look forward to meeting you so you can learn about the exciting activities that Cub.